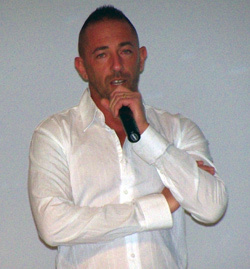 Antonio Urzi speaking in Mexico in March 2010. A UFO video captured in Milan, Italy on July 6, is making the rounds in the media. It appears to be a group of bright sparkly objects in the sky. The video is titled, “AMAZING! INCREDIBLE EBANI ON MILAN!! | SUNDAY 6 JULY 2014.” EBANI stands for Entidad Biological Anomalous No Identificada, or its English translation, Unidentified Anomalous Biological Entity, indicating that the man who videoed the object believes the UFO is a living being. The man who recorded the object is no stranger to UFO videos. His name is Antonio Urzi, and is known for having captured hundreds of pictures and videos of UFOs from the skylight in his apartment in Milan. Many of his images appear too good to be true, which causes some to question their veracity. Some have claimed that many of his pictures and video are actually objects he places on his skylight window and films from below making them appear to be UFOs in the sky. Often, skeptics note that there are rarely other people who claim to see these spectacular objects flying just over the city. However, there are many others who believe Urzi is the real deal. One of those people is Mexican journalist and UFO researcher Jaime Maussan. In March, 2010, Maussan held the World UFO Summit in Mexico City. One of the speakers was Urzi. Several times, outside of the conference, Urzi pointed up in the sky and claimed to see UFOs. I, along with my colleague Antonio Huneeus, were present with him on a couple of those occasions and saw the objects ourselves. UFO photo taken over the World Trade Center in Mexico City in March, 2010. The objects were first spotted by Antonio Urzi. (Credit: Paola Harris). The objects appeared to be small white orbs and sometimes traveled in groups. Waiting outside with a camera to see if I could spot one of these UFOs on my own, I was able to see a few of these objects. I actually caught one or two on video myself. However, I think what I was seeing was balloons. They sell balloons on practically every street corner in Mexico City and many of them are the shiny silver Mylar type, which would appear like what I got in the video. During that conference, a few of the Mexican UFO researchers showed videos of what they called EBANI. They explained these were UFOs that were often long and moved strangely. They believed they were actual biological entities. The EBANI researchers admitted some of them look like balloons, but they argued that the UFOs moved in such strange ways that they could not be merely balloons. 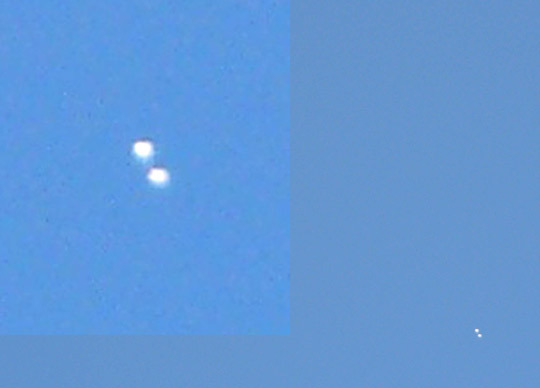 Is it possible that Urzi caught a string of balloons glistening in the sky in his latest viral UFO video? Or like some suggest, does Urzi have an uncanny ability to know when extraterrestrials will be flying by or purposely making their presence known? Take a look at this and other videos from Urzi on his YouTube channel and let us know what you think. Why do so many UFO enthusiasts (who spend so much time filming) not invest in a stabilized tripod and camera that requires no touch to pan or zoom? For example, a GoPro 4K resolution (ultra HD) can capture a wide field of view, can be mounted on solid immovable objects (even a wall) and then zoomed or panned post production. All this for less than $500. Some of these videos may indeed be authentic, but until some of these UFO spotters invest in some quality equipment and learn basics of the craft of digital video, I remain skeptical of their work specifically (but very open to UFO phenomena). Whenever you see ‘morphing alien’ commentary be prepared for something that is slowly rotating high in the sky and is captured at the practical limits of resolution of the telescope/camera etc. In this case its the same thing. The bright spots on the individual objects give away that they are actually individual objects bundled. The color of the reflection and the edges of the reflection give away that the objects are all the same color, silver, possibly white, but most likely silver based on the quality of the glints (specular hot spots) that you see from time to time. The slow rotation of the bundle that would move a little here and there looked to me to be exactly what a bundle of mylar balloons looks like when they get away. Note that when balloons are moving in the air column, they are feeling no net force WITHIN the column. The same physics holds when you go on a hot air balloon ride. You can drop a feather in the basket and it will lazily float straight down. Yet we could be moving 25 miles per hour. We are moving at the same speed as the air column we are within so there is no net force within the column on us. In the same way, mylar balloons will often appear to be moving in the same exact configuration and may NOT rotate at all when moving. They really are often mistaken for flying discs and so forth because of this property of air columns which allow objects within them to adjust to a position where the net force on them WITHIN the column is zero. This ‘net force’ thing is NOT related to the air column. If you take the balloon ONLY and examine all forces acting on it while excluding the air around it which is obviously pushing it (an obvious force), you find that there is many times NO force other than the air column acting on it so this is what I mean when I say “no net force WITHIN the air column”. Ok that said in this video we see some of that where the balloons do not move but then they do move as they encounter other air columns which is also quite common of course. So to ME, the speed, look, behavior, and movement are all completely consistent with a bundle of runaway mylar balloons… So Kudos to those who saw the same. #Aaron This is a blatant piece of Spam for GoPro. I hope they follow up and delete it. The Guy is obviously on a tripod and panned and zoomed in post – or is there some other explanation for the cut where it zooms out to show a passenger jet flying into and out of frame.